Yesterday, my son told me, that a friend told him, that our local Border’s Bookstore was closing. Thinking there may be bargains, I went over right after my sewing classes. Border’s is not closing, if fact the sign said, “free internet coming soon.” So no bargains and I wasted some of my sewing time. 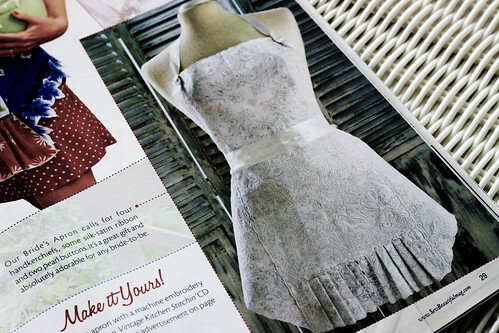 I browsed anyway and picked up the new “SewBeautiful” #126 magazine. It had a nice heirloom sewing detail, hemstitched box pleats, that I think I will use on a blouse. It also had an article about using napkins and handkerchiefs to make an apron. I have a bunch of embroidered napkins that I think will work for the apron below. Another project to put on my ever growing list. This entry was posted on Monday, September 28th, 2009 at 3:00 am and is filed under Sewing. Tagged: Sewing. You can feed this entry. You can leave a response, or trackback from your own site.